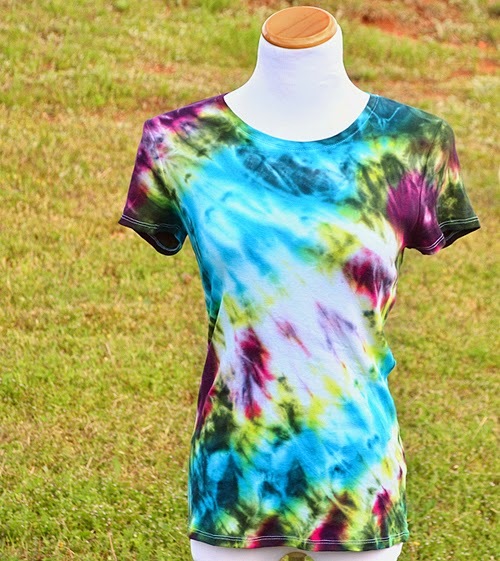 Tie dye is all about twists and folds and walking away with something completely unique and different every time. You can tie the exact same style of shirt the exact same way and there will always be differences to tell them apart. But why do so many only tie dye men's white cotton shirts? 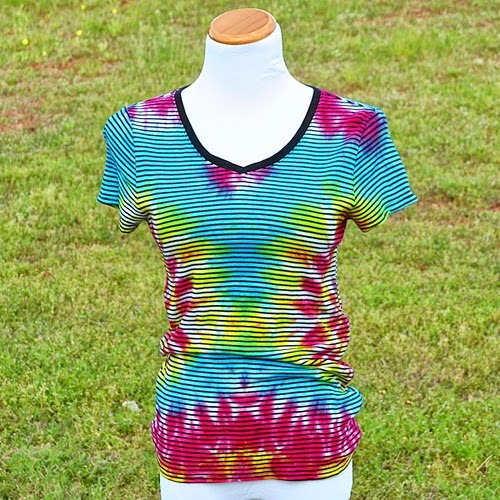 There are so many other options out there for us ladies to wear tie dye that is more flattering than an over-sized men's shirt. 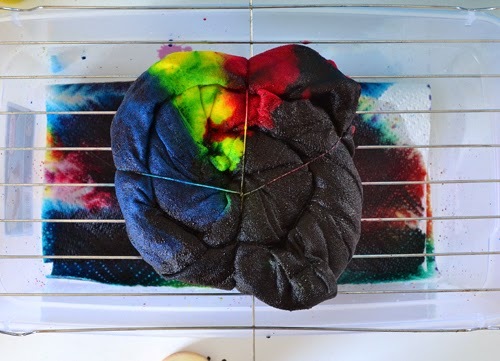 Today I'm going to show you tie dye with a bit of a twist. There are no rules only surprising results! 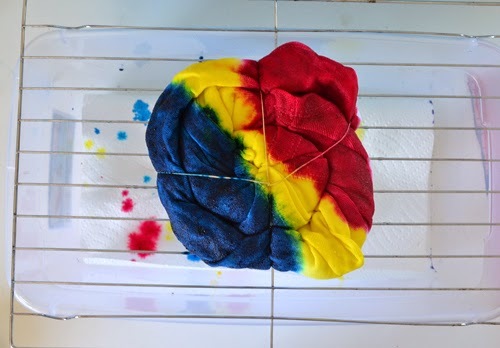 Tie Dye - I used an Artisan kit but any Tulip One Step Tie Dye kit will work great! Let's talk about supplies... mainly those shirts behind my tie dye kit. All 3 I chose are comfy women's cut tees from the ladies' section at Walmart. One is white (classic for tie dye, of course), one is a speckled mint green and the last one a black and white stripe. What they all have in common is that they are 100% cotton. 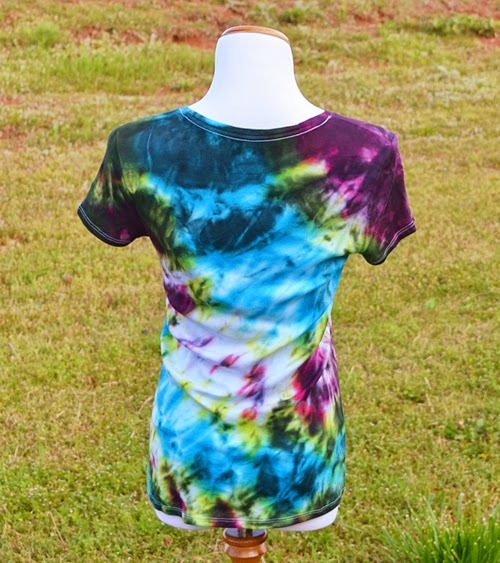 There are tons of shapes, colors and patterns of shirts that are perfect for tie dye. 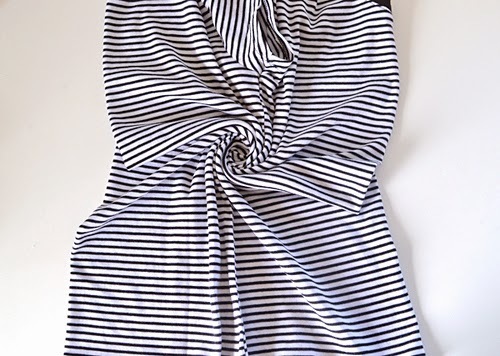 My striped tee is probably the most unexpected of the bunch but that twist makes it that much more awesome! 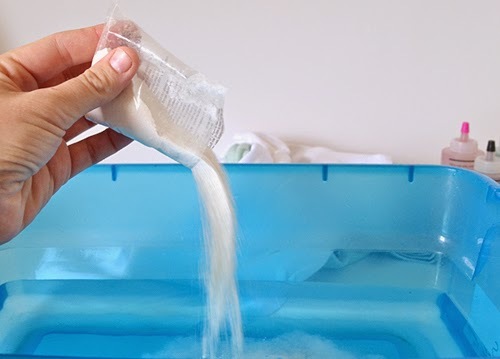 The Artisan kit comes with a packet of soda ash to soak your tees in. 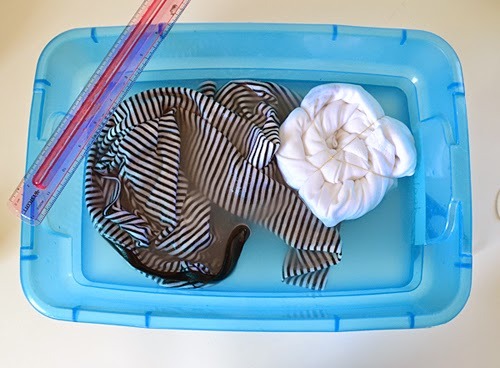 Added to one gallon of water this stuff will help your shirts take the color better. 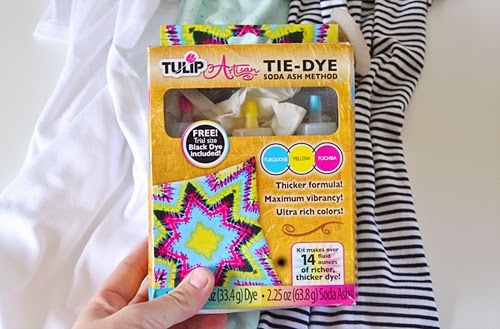 If using a Tulip One Step kit you don't need to do this because the soda ash is already in your dye bottles ready to go! 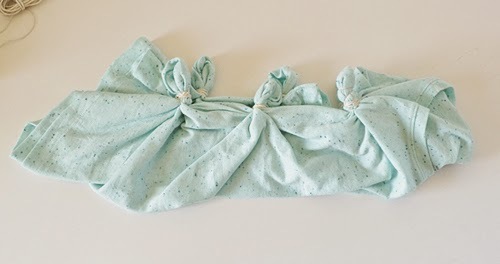 When soaking in the soda ash mixture you can either tie first and add for dry ties, or place the loose tee in and wring out for wet ties. This is my tie dye set up. Over the years my set up has changed but this is what I have found to be the best fit for me. It's just an old cookie rack over a plastic shoe box sized tub with a few paper towels in the bottom. 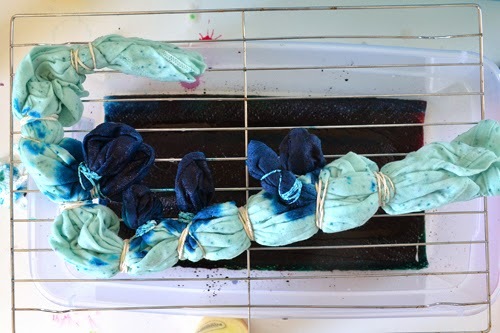 I know it seems such a small thing but in the end, allowing the dye to drip down rather than pool up means you get cleaner colors in the end. 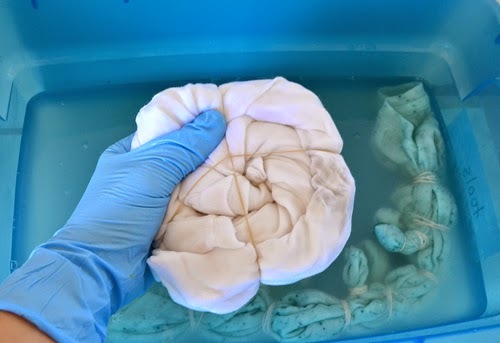 Before dyeing squeeze out as much of the water as possible. Take care not to damage your tie! 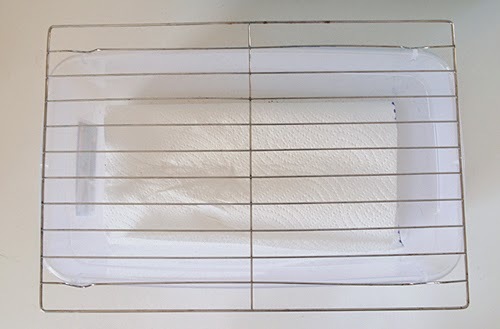 In between each flip of a tee and especially between different tees wipe your grate clean with a paper towel for cleaner colors. 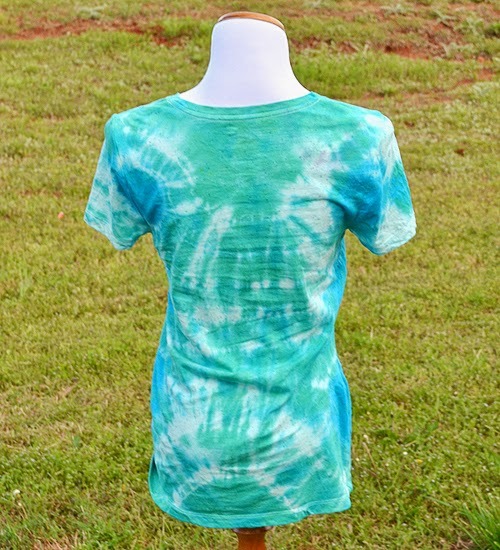 First up is my shades of green tie dye beauty. 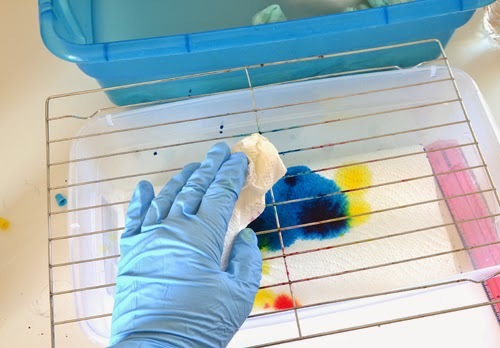 Now there are all sorts of tie dye patterns that you can follow to get certain results. 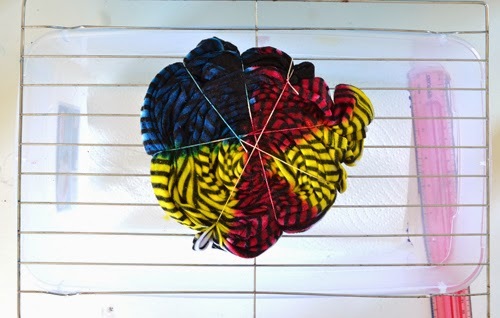 There is the spiral which is very popular and the bullseye too. Here I didn't use any pattern known to me and just went with it. To start I made knots on both sides of my tee, trying to make them as close to even across both sides as possible. 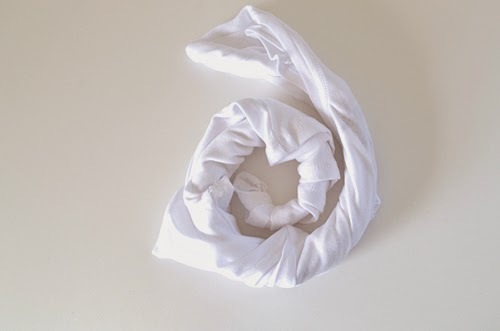 Next I folded my tee in half down the middle longways. From top to bottom I gathered and bound down the length with rubber bands. 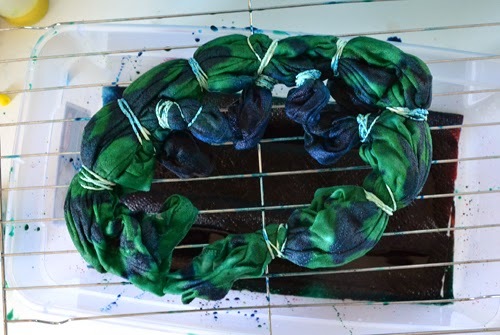 First I dyed my knots turquoise to make dots on the sides. I saturated the entire shirt in green and then used up what was left of my turquoise willy nilly. And this is the result! Because I dyed green and turquoise on top of an already green shirt, the end result is more subtle. The front and the back mirror pretty closely. Take your shirt and open it up. Run the seams under the arm pit area together. One one side you'll have the front, the opposing the back and your sleeves will be on the backside and front side in front of you. 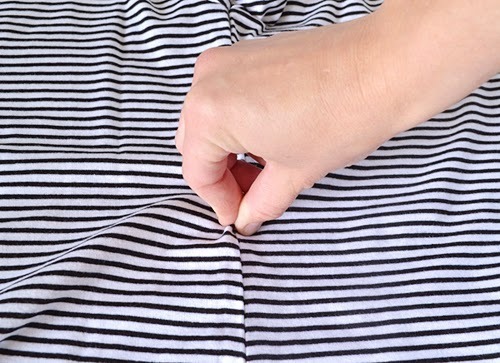 Along the seam, in about the middle pinch the fabric. 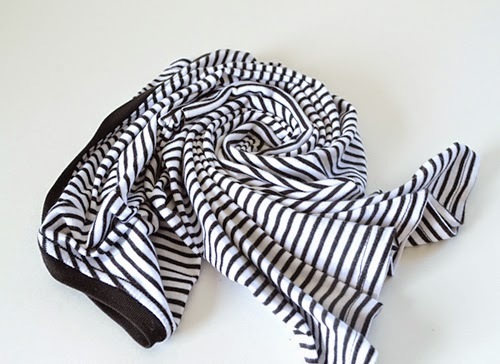 Begin to twist the fabric over and over causing a spiral to form. 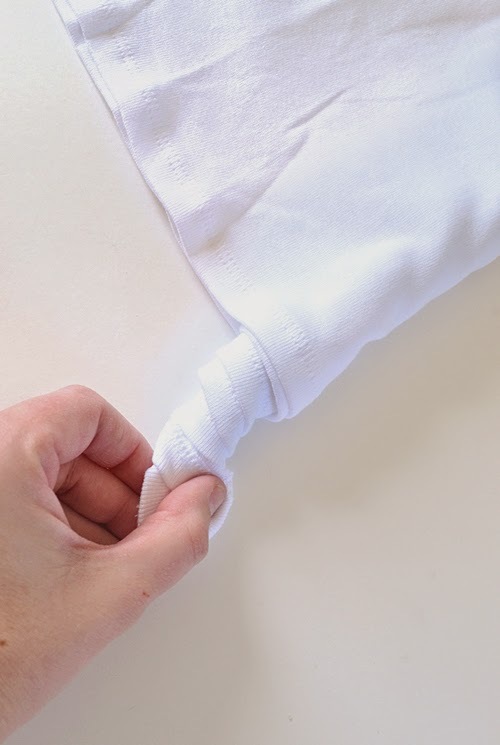 When it gets out toward the edges it will be more difficult to hold together, but make sure the fabric looks pleated and secure to the spiral of the shirt with a rubber band going across. 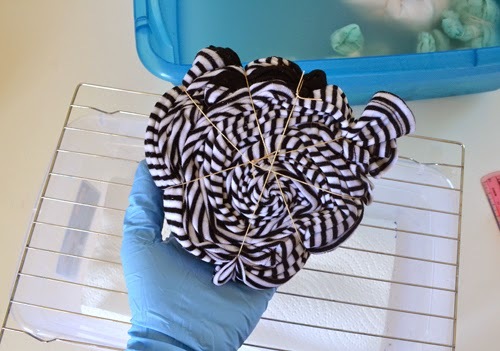 Use 4-5 rubber bands to keep the spiral together. Now I actually more often than not use waxed cord to tie my tees. I find that it's easier having a bit of a weak hand, but since I am allergic to latex it's what I prefer. Place the die on the spiral in a pie shape, with the center of the spiral being where they all meet. The results are stunning! 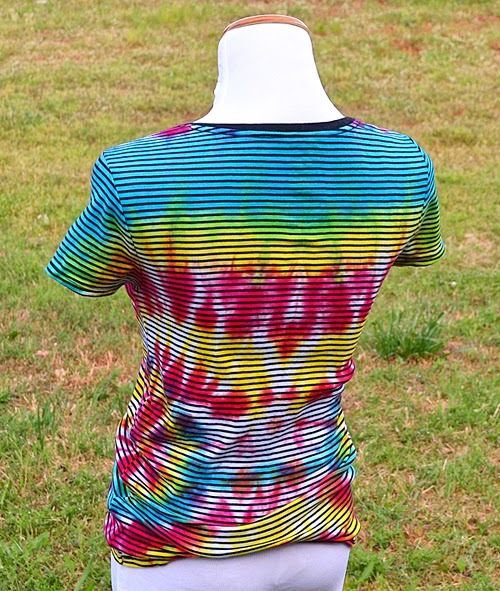 On top of the black stripes the shirt looks different from your average tie dye and the double spirals are interesting and unique. I also love that the front and the back are completely different with this tie! From one bottom corner to the opposing shoulder twist your tee like you're getting ready to pop somebody with a towel! Turn that rope shape into a tight spiral. 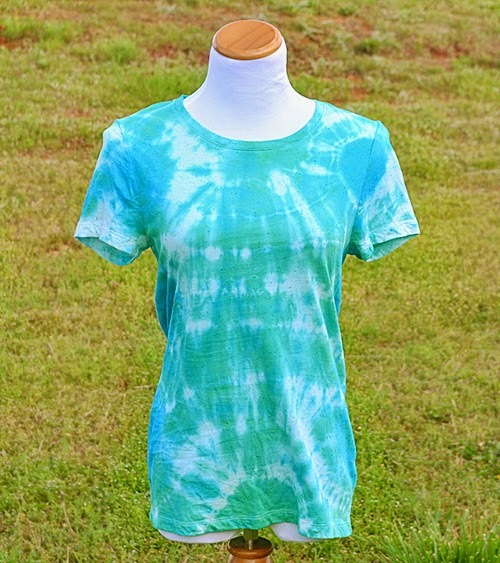 This tee was dyed in three colors across the spiral shape. Next it was overdyed with black. Overdyeing is just covering up the original dye job you did with another color. I used to think it meant using more dye than usual but it means to basically dye a color over another color or set of colors. Since I started my spiral in the shoulder area rather than the bottom hem, the result is color that seams to go in all directions from that shoulder. Though the black seemed overbearing in the pic just before, the end result has more of the yellow, turquoise and magenta than black. Neat, huh? If this is an actual pattern, I don't know the name of it but I love the results. 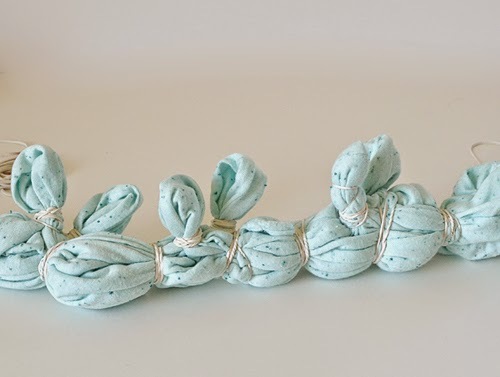 And if I never experimented I never would have found that I always love the tees I tie this way! 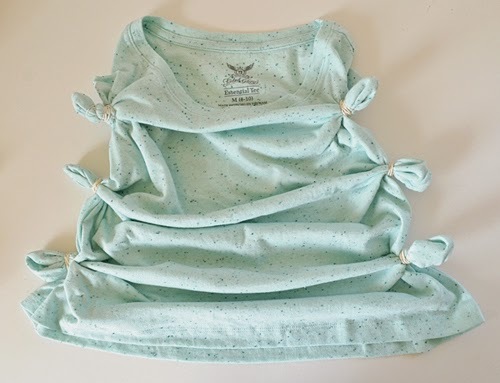 Taking tees with patterns and tying in unique ways makes an already fun and experimental craft to a whole new level! To see more of my crafts, please visit me at Dream a Little Bigger!